Sport-Fit Plus Armband for iPhone 7 is rated 1.8 out of 5 by 5. Rated 1 out of 5 by karr from Headphones I agree with the other review- there is no way I can use my headphones with this. I got it from Target and it had already been returned once and marked down significantly, but I didn't realize this was probably why. As you see the hole for the headphones is on the left and not in the middle for the lightning cable headphones that all iPhone 7's have. There isn't any way to fit the headphones in the tight pouch either. I hope this gets fixed before it continues to be sold. Rated 1 out of 5 by unsatisfied from Headphone jack and home button don't work We used out iPhone 5 arm band for years and it was great. Unfortunately the armband hole for the headphone hole is not in the correct place (it should be in the center and it is on the side). Also as others have said you can not use the home button or use the screen when the phone is in the arm band. It seems like it was made and not tested out on a new iPhone 7. Rated 1 out of 5 by NewiPhone7user from Home button not accessible! Received this as a gift for my new iPhone7 (got a lot of use of my old Belkin armband for iPhone5). Unfortunately, this armband was not updated to work with the new Home button functionality, so this is really useless. You cannot press/scan your fingerprint through the cover to use the Home button. Rated 2 out of 5 by marag from Home Button Doesn't Work!!! Had a Belkin armband for years.... Purchased a new one for my I Phone 7 and the home button is inaccessible! Really, couldn't they have figured that out before it went into production??? A pair of scissors and a quick hole cut through the plastic, now it works....nice. 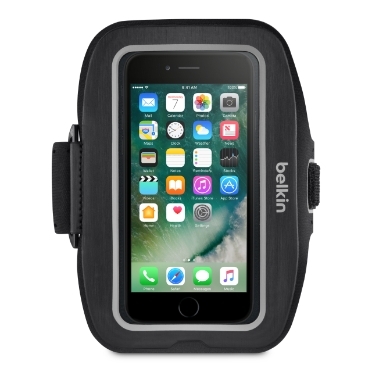 Rated 4 out of 5 by MikeK from Best armband I've tried many different armbands and have always found Belkin to be the best. It lasts, I can toss it in the washing machine and until the iPhone 7 version have always had good control of the phone while in the armband. Unfortunately, the latest iPhone 7 version doesn't allow access to the home button which limits the use of the phone in the armband. Otherwise, the rest of the functionality is the same as previous armbands and I praise them on quality, design and easy of use. Please fix the use of the home button to make this a perfect armband for any sport.